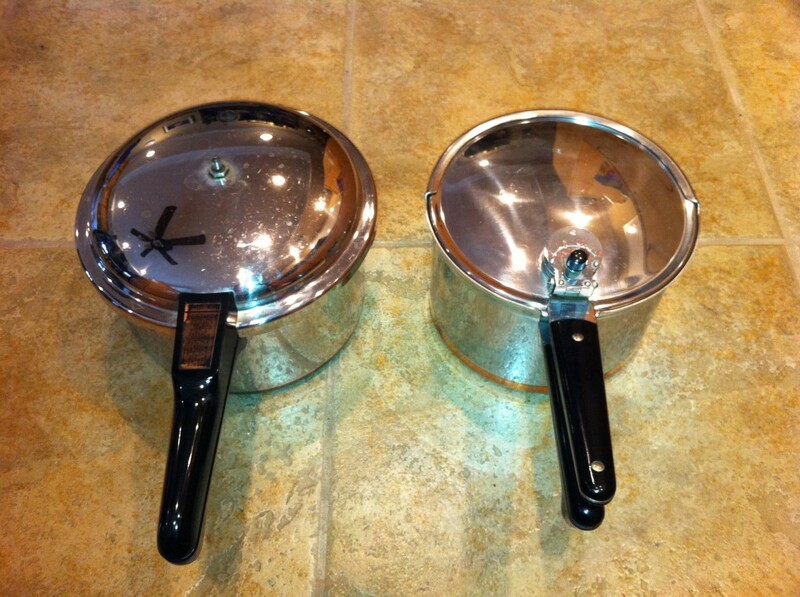 The Revere Ware vintage 4-quart pressure cooker, made during the 40’s and 50’s, is a great pressure cooker and we’ve sold quite a few replacement gaskets to people who want to keep them cooking decades more. The biggest problem with these units is the lack of availability of over-pressure plugs in the lids. These plugs are made with a hole through them filled with solder that will blow out at a certain pressure. Once the over-pressure plug is blown, it is done and needs to be replaced with another. 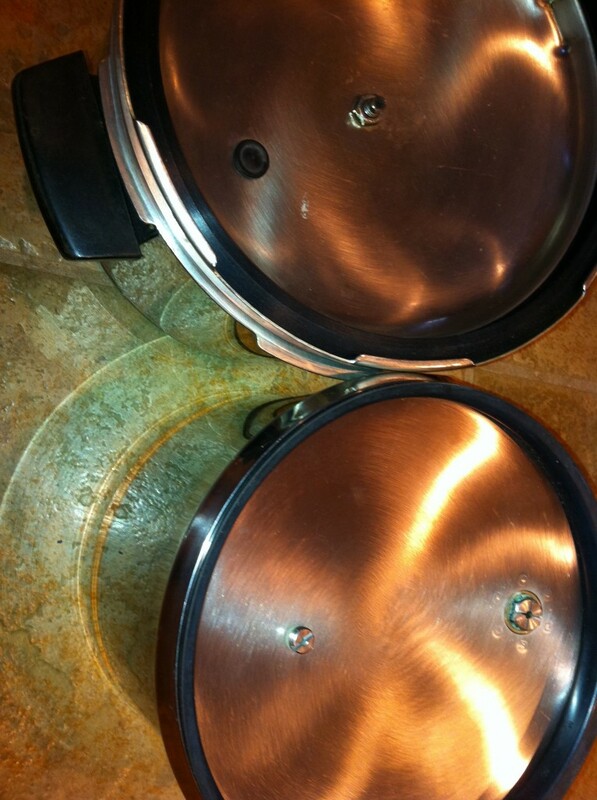 One possibility is to convert the pressure cooker to use an over pressure plug that is still available. 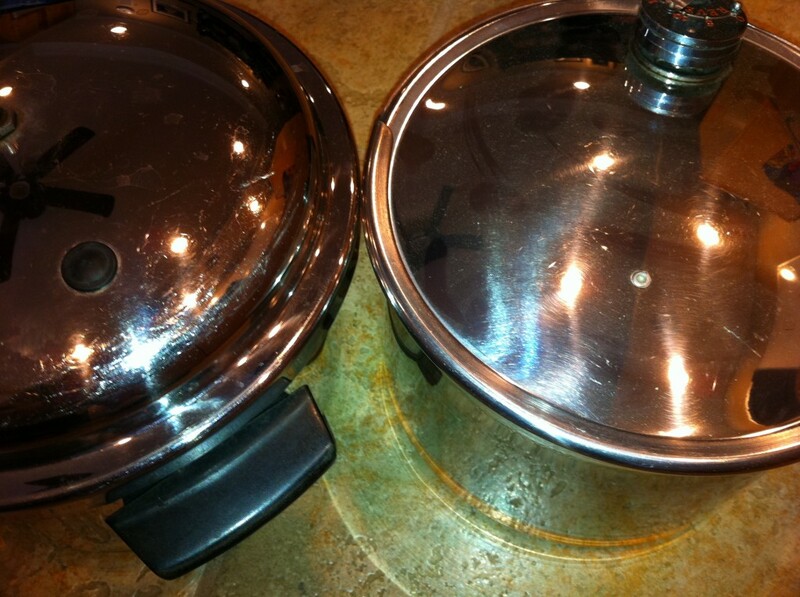 Specifically, Revere Ware’s model 1574 and 1576 pressure cookers use a simple rubber plug that fits in a 12mm hole in the lid. These plugs are identical to Presto part 09915. In theory, converting the vintage pressure cooker to use the new style plug should be easy – just drill out the hole for the current over pressure plug with a 12mm metal drill bit. 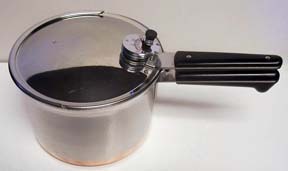 The vintage 4-quart pressure cooker has an operating pressure up to 15 lbs and the 157x models work up to 17.5 lbs. Below are some comparison pictures between the vintage 4-quart and the 1574. If anyone is going to attempt this conversion, please send us pictures and let us know the outcome. As with anything pressure cooker related, we advise that you use caution. Has anyone done this? I just discovered the over pressure plug on my recently acquired 4Qt is broken. Not yet … you could be the first. I’m going to try this today. I’ll report back, and hopefully with good results! The hole is smaller than 12mm. I drilled it at 12mm and the rubber stopper is loose. The pressure cooker will hold pressure, but since the new rubber pressure plug fits loosely you have to pull it up to get it to seal as the pressure is building. This is not ideal and seems dangerous. I’m not going to try to cook anything in it for fear of it blowing out. If I was to do this again I’d start at 11mm and see how it fit. 12 mm is as measured on the 1774 and 1576 parts. It seems likely that the lid thickness might be different between the 157X models and the vintage 4-quart model, causing the plug to sit in more loosely. Perhaps a slightly smaller hole would make a difference. The Presto part “works” in the 157X models as reported by customers but it might not be as ideal of a fit as the original parts for that model either. wrap some string around the plug to hold it away from the lid. That should do it. Umm … that hole from which the solder blew out is only about 1/8″ in diameter. I’m wondering why you couldn’t simply clean it out good and put in another drop of solder … ? From my understanding of solder, there are different varieties (with different amounts of silver and other metals in the alloy) such that different solders have different melting points. If you happen to use one that has a higher melting point than the original solder, or use a thicker solder bead, it could change the amount of temperature and pressure required to blow the over pressure plug, allowing the pressure to build to a dangerous level. I sympathize with your disappointment. That is definitely one of the parts the vintage Revere Ware community needs. The problem with that plug is that it is vastly different than the other parts we have made, and I am not sure we would be able to make it right. Gaskets are pretty simply and the only requirement is that they seal. The same material is available as was originally used, and because there is an over pressure plug, there are limited safety concerns. However, with the over pressure plug, there is no backup. If it doesn’t work properly, it can have some consequences. I did a search to see if I could find any other evidence of an over pressure type plug that uses solder, and I was unable to find any. With that plug, there are no specifications of what type of solder is used or how thick it needs to be. Making that would likely be a shot in the dark which means there is far too much liability involved. However, I did just order a Presto pressure cooker so that I can measure the size of the hole the Presto 09915 plug fits in, and the thickness of the top, to see about what it would take to modify a Revere Ware 4qt lid to properly accept that type of plug. 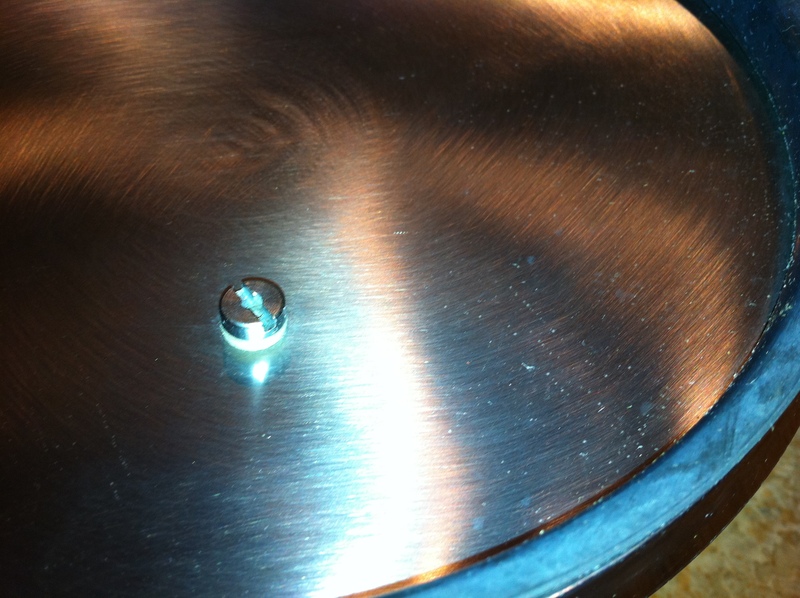 If it is simply drilling a hole, it would be a feasible retrofit to get a pressure cooker working again. It’s been a few months but I thought I’d ask; did you get around to measuring the Presto cooker hole relative to the Revere ware? 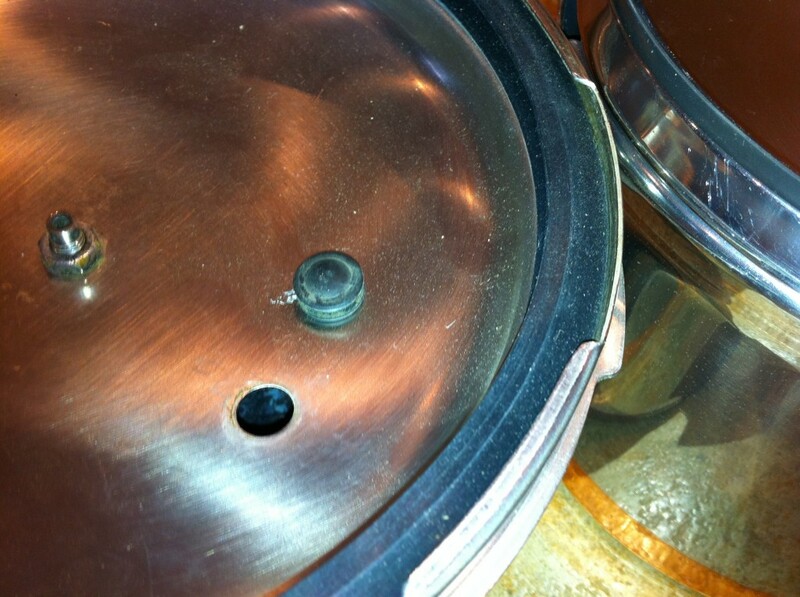 Also, my revereware pressure cooker has an “still sealed” overpressure valve (the hole is blocked). I am wondering what an good intact one looks like or how to tell if the original solder is what is currently in there (as opposed to glue or something if a previous owner filled it for some reason) and that the solder is in OK condition. The hole is .5 inches, or 12.7mm. The diameter of the plug that goes in the hole, at the point that sits flush to the hole, is .465 inches, or 11.7 mm.